Occupations of the month: April―Within a farmyard, a woman milks a cow with a bell around its neck. To the right, a man pushes a sheep out of a sheepcote. A shepherd, holding a lamb in his left hand and a crook in his right hand, looks on. A flock of sheep and one goat follows a second shepherd along a path leading from the sheepcote. One of the ewes nurses a lamb. Beyond, a woman churns butter within a farmhouse. 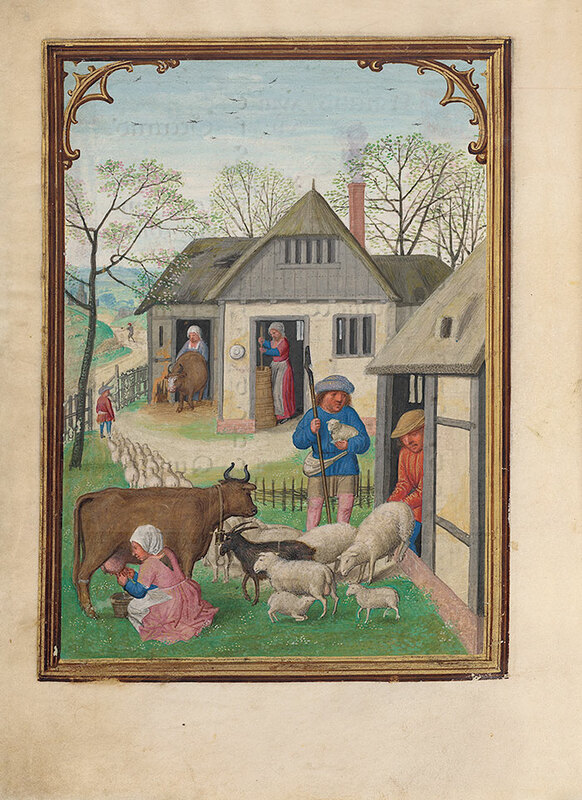 To the left, another woman follows a cow out of a stable beside the farmhouse.